COULEUR, PLAQUE D'ADAPTATION ET LONGUEUR DU TUBE Choisir une optionNOUS ALLONS VOUS CONTACTER POUR CES CHOIX. VOIR LES DÉTAILS DANS LA DESCRIPTION. LE PRIX RESTE LE MÊME. La conception modulaire du MOONLITE PORTE-OCULAIRE CS 2″ POUR SCT & RC grand format le rend très versatile. Vous n’avez qu’à choisir les options disponibles. Assurez-vous de lire la description et d’écrire en commentaire de votre commande les informations demandées. We offer the CS 2″ format focuser in many configurations. Everything from single rate configuration for customers that may all ready have a motor to install on it, to our popular dual rate 8 to 1 reduction unit for visual use, and our many types of motor systems for fully automated focus. There are many different draw tube travels and configurations to match just about any scope’s requirements. Our collimatable mounting flanges provide adjustability for achieving mechanical centerline collimation. Our shaft lock option provides focus lock with no image shift. Custom anodized colors and custom machining (by request) make for a perfect custom focuser to match your OTA. For Customers with EDGE scopes, please see the CHL 2.5″ thin model made just for EDGE 8″, 9.25″ and 11/14″ OTAs. For customers imaging with large cameras or using large loads, please look at the CSL 2.5″ large format focuser. For customers with very large imaging systems or full remote automation requirements, Please consider the CXL or Nitecrawler rotating focuser models. We also provide a (focal reducer) version for 8″ and 9 1/4″ SCTs that have the smaller 2″ SCT threaded visual back. We made a special 2-part split flange system to support a focal reducer installed inside the focuser. This special design allows it to fit on SCTs that have the smaller 2″ SCT threaded back. The installation procedure requires the user to remove the bottom rotating flange part, then install the focal reducer by threading it in to the drawtube. The flange is then reattached to the focuser and the focuser can then be installed on the scope. MoonLite manufactures many different size flanges for the CS model focuser that fit all SCTs, Vixen, Tak Mewlon, Questar, RC, Lunt and Coronado solar telescopes. All flange options are free. The rotating flange is made up of 2 parts. An upper flange part that attaches to the focuser body with 3 bolts and a lower threaded flange part that matches the SCT’s visual back threads. We make 2 versions of the lower flange part. A regular profile version and a tall Focal reducer style version. The flanges come in 3 thread sizes, 2″ SCT thread for 8″ and 9 1/4″ scopes, 3 1/4″ large thread for 10″ ,12″ and 14″ scopes, plus a 4″ thread size for Meade 16″ SCTs. All 2-part flanges have a rotating ability with a lock knob providing camera angle adjustment plus collimation adjustment ability. There are 2 category of flanges to consider ( Regular profile, and FR style). The regular profile flanges are as short as possible and do not support a focal reducer installed inside the focuser, while the tall Focal Reducer style flanges have a pocket /space for the focal reducer to move in side the flange area. Basically the regular profile flanges are for visual use and the taller focal reducer flanges are for Imaging use. However the focal reducer does not have to be installed, so the tall focal reducer style flange can be picked if the scope is to be used for both visual and imaging. The flanges come in 4 thread sizes for SCTs, 2″ SCT thread size, 3 1/4″ Celestron thread size, 3 1/4″ Meade thread size, and 4″ thread size for Meade 16″ scopes. The 2″ SCT thread flange is for 8″ and 9 1/4″ SCTs. The 3 1/4″ Celestron threaded flanges fit 11″ and 14″ Celestron visual backs and the new 9 1/4″ Celestron Edge. The 3 1/4″ Meade threaded flanges fit Meade 10″ ,12″ and 14″ Meade Visual backs. We also make some specialty flange thread sizes for Vixen, Tak Mewlon, AT RCs, and Questar scopes. It is important to pick a matching drawtube and flange combination when configuring the MoonLite focuser. All tall focal reducer style flanges require that the .95″ travel FR threaded drawtube be picked if a traditional 6.3 or 3.3 focal reducer is to be used. The tall focal reducer flange types and the .95″ drawtube are matched pairs that provide the most travel with still providing room in the focuser for a 6.3 focal reducer to be installed. This matched combination is for imagers that need to use a focal reducer. However the optional long 1.5″ travel drawtube can be combined with the tall focal reducer flange , but it would not allow any focal reducer to be used. The regular profile flanges in the 3 1/4″ thread size use the 1.15″ travel comp ring drawtube. The regular profile flange is ideal for visual users that will not need to use a focal reducer. The regular profile 2″ size threaded flange does end up using the .95″ travel FR style drawtube, but no focal reducer can be installed with this short flange version. 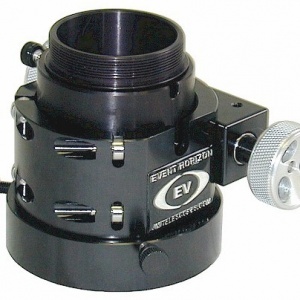 Remember Meade 8″, Celestron 8″, and Celestron 9 1/4″ SCTs only have the smaller 2″ SCT threaded visual back. The large 3 1/4″ flanges can not be used on these scopes that have the smaller 2″ SCT threaded back! The exception is the New 9.25″ Celestron EDGE model that now has the larger 3 1/4″ threaded visual back. 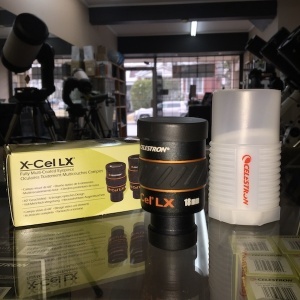 Please note all Celestron EDGE scope 9.25″ and larger should use the 3 1/4″ Celestron regular profile flange and matching 1.15″ travel compression ring drawtube. 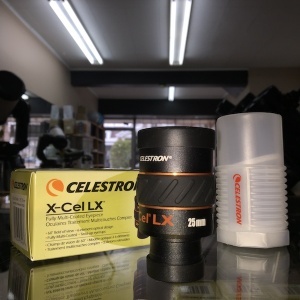 Celestron has not released a focal reducer spec for the EDGE scopes as of this time. We are getting ready to release a new CSL 2.5″ larger format focuser that has an adjustable Focal reducer position system. This new CSL model will be Ideal for the Edge scopes and can hold any brand focal reducer such as the popular Lupus reducer that customers are starting to us on Edge design SCTs. Please note: The focuser models designed for Focal reducers are intended for Imaging, it is recommended that the focal reducer be removed from the focuser for Visual use. The design places the focal reducer in the sweet spot distance from the focal reducer to the imaging system, between 2 1/2″ and 3 1/2″. If a diagonal is used then the distance between the focal reducer and an EP may be too great and traditional EPs may not come in to focus. A diagonal adds a few inches to the image train. Please see the flange text below to double check that you are picking the best matching drawtube for the flange required. The 2″ SCT thread regular profile flange fits Meade 8″ and Celestron’s 8″ and 9 1/4″ scopes. The best matched drawtube option is the .95″ travel comp ring FR version drawtube. Note the .95″ travel FR comp ring draw tube is the most popular drawtube for the 2″ SCT threaded flange combination. This flange is both rotatable and collimatable, it is a 2-part flange. The 2″ SCT thread tall focal reducer flange fits 8″ and 9 1/4″ SCTs. This is a 2 part flange especially designed to split apart allowing the focuser reducer to be installed in side the focuser. This flange is both rotatable and collimatable. The correct drawtube for this flange is the .95″ travel comp ring drawtube threaded for focal reducers. However the long 1.5″ travel comp ring drawtube will fit in this tall flange providing a large amount of travel, but would have no room for a focal reducer to be installed. The 3 1/4″ Meade thread regular profile flange fits 10″, 12″ , and 14″ Meade SCTs. It is rotatable and collimatable. The correct drawtube for this flange is the 1.15″ travel comp ring version. 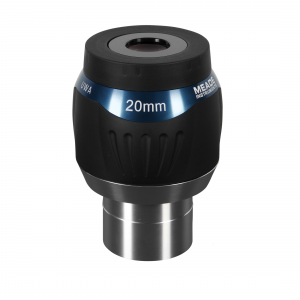 The 3 1/4″ Meade thread tall focal reducer flange fits the 10″, 12″ , and 14″ Meade SCTs. It is rotatable and collimatable. The correct drawtube for this flange is the .95″ travel comp ring drawtube threaded for 6.3 and 3.3 focal reducers. This matched pair of Flange and drawtube give the focuser the ability to hold the reducer inside the focuser. The 3 1/4″ Celestron thread regular profile flange fits 11, and 14″ Celestron SCTs. It is rotatable and collimatable. The correct drawtube for this flange is the 1.15″ travel comp ring version. The 3 1/4″ Celestron thread tall focal reducer flange fits the 11″ and 14″ Celestron SCTs. It is rotatable and collimatable. The correct drawtube for this flange is the .95″ travel comp ring drawtube threaded for 6.3 and 3.3 focal reducers. This matched pair of Flange and drawtube give the focuser the ability to hold the reducer inside the focuser. The Lunt flange comes in both a single stack version and a double stack version for the 60mm and 80mm OTAs. The correct drawtube option is the 1.5″ travel comp ring drawtube. It is rotatable and collimatable and uses a special thin upper flange. The flange attaches to the existing scopes radial dove tail mount with 3 set screws. The Lunt 100mm flange is a little longer to clear the double stack etalon version. It fits the 100mm OTAs. The correct drawtube option is the 1.5″ travel comp ring drawtube. It is rotatable and collimatable and uses a special thin upper flange. The flange attaches to the existing scopes radial dove tail mount with 3 set screws. For the Lunt 50mm, please see the CM mini Lunt 50 model. It is a 1 1/4″ format focuser just for the Lunt 50 OTA. The large 4″ Meade thread for 16″ regular profile flange fits only the 16″ Meade SCT. It is rotatable and collimatable. The correct drawtube for this flange is either the 1.15″ travel comp ring drawtube. The larger 4″ Meade thread for 16″ tall focal reducer flange fits only the 16″ Meade SCTs. It is rotatable and collimatable. The correct drawtube for this flange is the .95″ travel comp ring drawtube threaded for 6.3 and 3.3 focal reducers. This matched pair of Flange and drawtube give the focuser the ability to hold the reducer inside the focuser. The Vixen flange fits the VMC260. The correct drawtube for this flange is .85″ travel comp ring version. It is rotatable and collimatable. The Questar flange fits the 7″ Questar threaded back. It is rotatable. The correct drawtube is the .85″ travel comp ring versions. It is rotatable and collimatable. The Tak Mewlon 300 flange fits the Mewlon 300 threaded back. The flange has a Male thread. The correct drawtube is the .85″ travel comp ring version. It is rotatable and collimatable. The Tak Mewlon 180 to 250 flange fits the 180, 210, 250, and 212 Mewlon threaded back. It is female thread and is rotatable/ collimatable. The correct drawtube is the .85″ travel comp ring version. The special Tak Mewlon 250 male thread flange fits the 250. The flange is Male on the focuser side, not female. The correct drawtube is the .85″ travel comp ring drawtube. 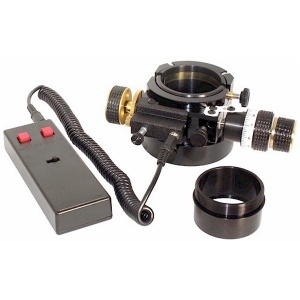 TAK FS60C flange allows the short CS focuser to fit on the FS60C refractor. The correct drawtube is the 1.5″ travel comp ring. The RC 90mm X 1mm flange fits all brands of 6″ and 8″ RC scopes. The flange is rotatable and collimatable. The correct drawtube option is the 1.5″ travel Comp ring drawtube. This focuser threads on to the included spacer rings that are provided with RC OTAs. The RC 117mm X 1mm flange fits all of the 10″, 12″, 14″, and 16″ RCs threaded visual backs. The flange is rotatable and collimatable. The correct drawtube option is the 1.5″ travel Comp ring drawtube. This focuser threads on to the included spacer rings that come with the RC scopes. The Solar Max I 60mm flange fits the original Solar max scopes with out the tuner. The correct drawtube is the 1.5″ travel comp ring. It is collimatable and rotates. Please note: Fork mounted SCTs may have limited clearance with the focuser swung down into the fork area. Please consider any clearance issues before picking a focuser flange. MoonLite has many knob and motor configurations. Manual knob systems such as the Single rate, Dual rate, and Dual rate with shaft lock options. Then non PC controlled DC motor options for both Focus and Rotation. Plus our popular automated High res stepper motor options for fully PC automated configurations such as the High res stepper motor with Mini V2 controller, High res stepper motor with DRO dual port display controller, and High res stepper motor and Rotator with Dual port DRO display controller. Please use the pull down menu located at the bottom of this page to select the configuration you need. All motor and rotator options can be added at a later time, they just bolt right on to the existing focuser. 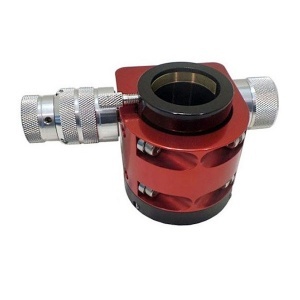 CS focuser with Single rate configuration uses 2 regular 1.5″ diameter knobs providing .58″ travel rate per revolution. The single rate configuration is only recommended for light weight duty due to the 3 lb vertical load capacity. Almost all MoonLite focusers are dual rate or motorized versions, however we do offer this single rate model for customers that may have an existing motor kit to install on it. CS focuser with Dual Rate option is a 2 speed configuration. The fine knob uses an 8 to 1 reduction unit featuring a preloaded, all ball bearing planetary reduction design that has no backlash or play. The Reduction units are hand lapped giving them a very smooth feel with no sticky or notch action even at very fine movements. The inline unit can simple be rolled by the slightest touch of your finger to make very fine focus movements. The Dual rate option gives the CS model focuser a 5 lb. capacity intended for visual use. CS focuser with Dual Rate with Shaft Lock option adds a micro shaft lock system to the left side coarse knob. The Shaft Lock option uses a unique mini brass compression ring clamp sub system that allows the user to lock the shaft with out deflecting the drawtube. This type of focus lock is much better then the old « thumb screw against the draw tube » style that would shift the image when pressed against the draw tube. The Dual rate with shaft lock gives the focuser a 6 lb capacity rating. CS focuser with DC Motor option – The DC motor with slip clutch option uses our Dual channel battery operated hand controller for Non-PC use. It allows adjustable speed control for focus on the first channel, and the 2nd channel is available for running a 2nd focuser, or our rotating flange option. The slip clutch feature on the motor allows both manual operation using the knobs and electronic hand controller operation at the same time. The DC gear head motor and battery operated hand held controller combination are ideal for operation of the focuser when a Computer is not going to be used. The DC motor is good for both visual or imaging and provides a 7 lb capacity rating when installed on the focuser. CS focuser with DC Motor and rotator option – The DC motor with rotator options includes the DC focuser motor and dual port hand controller above but with an additional 2″ format rotator and DC motor. The 2′ rotator is a Double bearing design and is belt driven with a Kevlar 1/4″ wide belt. It installs between the upper and lower flange of the CS model focuser. It uses the same battery operated DC Dual port hand controller intended for Non-PC use. It allows adjustable speed control for focus on the first channel, and the 2nd channel plugs in to the DC rotating motor also allowing for speed and direction buttons. The slip clutch feature on the motor allows both manual operation using the knobs and electronic hand controller operation at the same time. The DC gear head motor and battery operated hand held controller combination are ideal for operation of the focuser when a Computer is not going to be used. The DC motor is good for both visual or imaging and provides a 7 lb capacity rating when installed on the focuser. 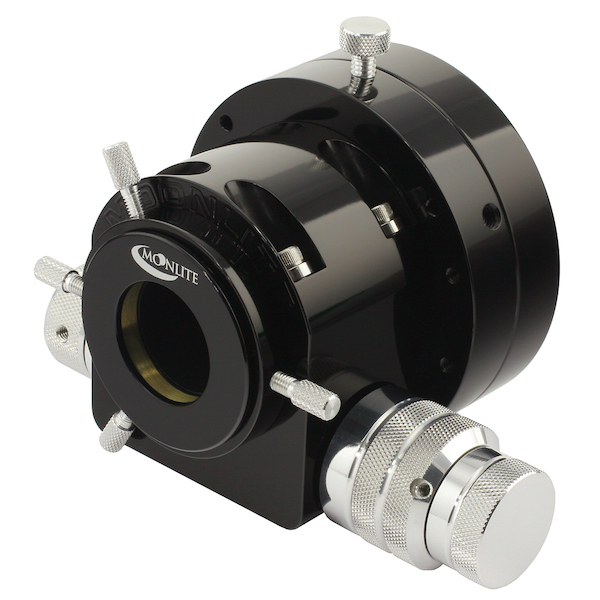 Please note the 2″ Rotator adds 1.22″ to the focuser profile once installed. CS focuser with High Resolution Stepper Motor/stand alone motor — Is for customers that may all ready have a stepper motor controller. – The high resolution stepper motor option provides extremely fine .00008″ 1/2 step or .00016″ per full step focus resolution. The motor provides an 7 lb. load capacity once installed on a CS focuser. 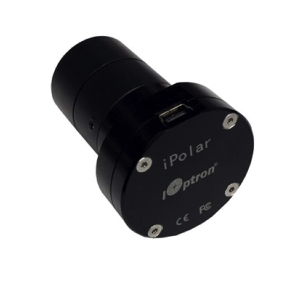 It gives the focuser a high level of focus resolution and automated focus ability for todays imaging requirements when using a PC. The high resolution stepper motors slip clutch feature allows both manual operation using the focusers knobs and electronic PC control at the same time. The stepper motor follows the 9 pin DBA standard pin out so it will work with ROBO focus (pin for pin) controllers along with many other brand controllers. We offer two different controllers below if you do not have a controller. Please see Motor options for more details: Motor Focus Options Please note that a controller is always needed to run a stepper motor, it can not plug directly in to a PC. CS focuser with High Resolution Stepper Motor with MoonLite Mini V2 Controller. The high resolution stepper motor with mini V2 controller features a remote temp probe, Speed control knob, and up/ down buttons on the controller box for manual operation using the controller. The mini V2 is the most popular controller providing full PC control. It uses a USB connection to your PC and runs off standard 12 volt DC. We include an AC adapter with a universal plug so it will work in any country, USB cable, 9pin DBA cable, and remote temp probe. Works with all ASCOM based software once the driver is loaded. We also include a Non- ASCOM program for customers to operate the focuser that may not have ASCOM set up. The SKYX Pro has a direct plug in for it as well. The 7 lb. load rating and precise focus ability make this a good configuration for moderate size remote imaging platforms. The slip clutch feature for manual knob operation is always included with all Motor options so the focuser can be used in many configurations, manual knob, controller buttons, or remote PC operation. CS focuser with High Resolution Stepper Motor with Dual Port DRO Display Controller. This option includes a 2 port controller and can operate 2 separate focusers at the same time, or 1 focuser running both focus and a rotator. It is a full ASCOM compliant controller along with the high resolution stepper motor with slip clutch. Along with our ASCOM driver, we also include 2 basic Non- ASCOM program for customers to operate the focuser that may not have ASCOM set up. The non ASCOM programs provided are for either 2 separate focusers, or 1 focuser with both a focus and rotator stepper motor. This controller is best for both visual and PC operation due to its buttons and full DRO display on the controller box located at the scope. It has a fine and fast mode using the buttons on either channel with a full DRO position readout on the display that shows the exact step count position just like in the software of your favorite imaging program. The controller has a remote temp probe just like the mini V2 above and full digital display, plus manual buttons for stand alone use. The 7 lb. load rating on a CS model focuser and extreme precise focus ability at .00008” resolution 1/2 step, or .00016″ full step. very accurate focus with little backlash make this a good configuration for permanent and remote imaging platforms. This controller / stepper motor option is recommended for both PC and hand held manual operation. It comes with universal voltage AC adapter and USB cable. The slip clutch feature for manual knob operation is always included with all Motor options so the focuser can be used in many configurations, manual knob, controller buttons, or remote PC operation. CS focuser with High Resolution Stepper Motor and 2″ Rotator with Dual Port DRO Display Controller. The 2″ rotator is added in with the Dual port DRO display controller and High res stepper motor on the focus side for a full automated solution. 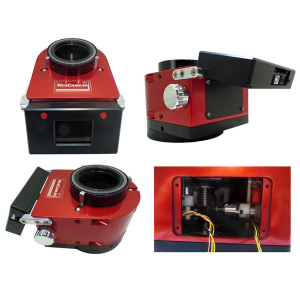 The Stepper Motor rotator kit spins the complete focuser including all imaging equipment connected at a .01 degree resolution for a Full PC automated solution. The rotator is a 1/4″ wide belt driven design with a double bearing design for high load capacity. The rotator kit requires the Dual Port DRO Display Controller to be used for the original focus stepper motor and the rotator stepper motor. The rotator adds about 1.22” to the existing focusers profile, so please check to see if the extra profile is acceptable. Both focus and the rotator can be ran manually with the controller buttons or MoonLite’s non-ASCOM utility program, or with any ASCOM program. Our ASCOM driver (requires 6.0 or later ASCOM platform), see the download tab on our web page for latest software and Installation documentation http://focuser.com/downloads.php. MoonLite offers ASCOM drivers to run with your existing imaging software, and a simple non ASCOM program for customers not running a full blown ASCOM automated system (for someone who just wants a simple automated control app to run the focuser). There is also SKYX direct plugin for Moonlite focusers, see daily build for the latest version for TheSKYX. For a full listing of all software see the Download tab on our Web site. Please note: Motor kits can be added at a later time, as we sell motor kits that customers can install themselves. Note: No damage will be done if the focuser motor continues to run past the mechanical stops of the drawtubes travel. Even if the clutch is tight, it will simply slip when the travel runs out. 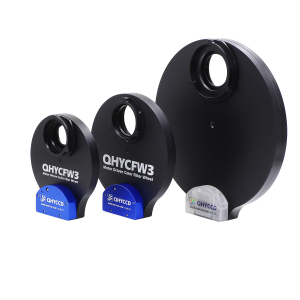 All CS model focusers equipped with a 2 part flange can be collimated. All focusers have a lifting capacity adjustment. Lifting Capacity: The drawtube pressure can be adjusted to each user’s preference. Increasing the pressure increases the load capacity (vertical lifting capacity) of the focuser. Decreasing the pressure lowers the load capacity but gives the focuser a smoother focusing action. We set the focuser at approximately 5 lbs. at time of assembly; however, you can adjust it to be more depending on your specific needs. The ideal setting is to have it adjusted so the focuser can hold the heaviest load presented without slipping and requiring no additional force. This will give the focuser the best feel and still provide the vertical lifting capacity required. To adjust, turn the aluminum thumbscrew located between the two setscrews on the bottom of the focuser CW to increase load capacity. The aluminum thumbscrew can only add pressure, not take away pressure. This is due to the 2 set screws on each side of the thumbscrew applying a min set pressure amount. In some rare case it may be necessary to do a coarse adjustment by turning the 2 setscrews located on each side of the aluminum thumbscrew (1/8 Allen wrench) a very small amount. Normally, 1/20 of a turn or less should be made on the setscrews in a CW direction, then check the lifting capacity pressure by racking the drawtube up and down with your heaviest load. Note: adding a Motor option will increase the focuser lifting capacity over the regular manual knob system. To maintain the CS focusers performance, keep all bearing and shaft riding surfaces clean. All crayford style focusers require a clean bearing to drawtube surface for smooth operation. The drawtube has been polished to remove all machine marks and anodized resulting in the action having a super smooth feel. Keeping the surfaces clean will keep the focuser operating at optimal performance. NOUS ALLONS VOUS CONTACTER POUR CES CHOIX. VOIR LES DÉTAILS DANS LA DESCRIPTION. LE PRIX RESTE LE MÊME.